Every day sees an act of kindness, generosity, sacrifice and courage in our small community. From the friend who visits sick neighbours to the single parent struggling to raise children alone. From the sick child who always has a smile to those who work sacrificially to ensure our community is a wonderful place to live. The High Halstow Relief in Need Charity is once again sponsoring the Heron Awards. It has been 10 years since we last ran our community award schemes there are lots of good people out there who deserve to be recognised and thanked for the difference they make to us all of us. So often we don’t realise what a person makes till they are no longer here and then it dawns on us what we have lost. Let’s try our best to change that and say thank you while they are still here. Maybe what they do will inspire others to do the same. There will be a special award night on June 28th so book the date now and join with us as we celebrate the efforts of our friends and neighbours. There are two main categories ; “Junior” (under 16) and “Adult” (over 16). Each main category has 3 further divisions as listed below. There will also be a “Community Hero” chosen by the judges from the nominees. Applications must be completed in full, put into a sealed envelope marked “Heron Awards” and deposited in the Rectory letter box (2 Cooling Road, High Halstow ME3 8SA) or handed into the shop no later than 10th June 2017. Applications maybe supported by one A4 page of supporting information, but no photographs. The judges are nominated by The High Halstow Relief in Need Charity and the judges decision will be final. You may nominate anyone who lives, works or attends schooling the village or makes a significant contribution to the village. 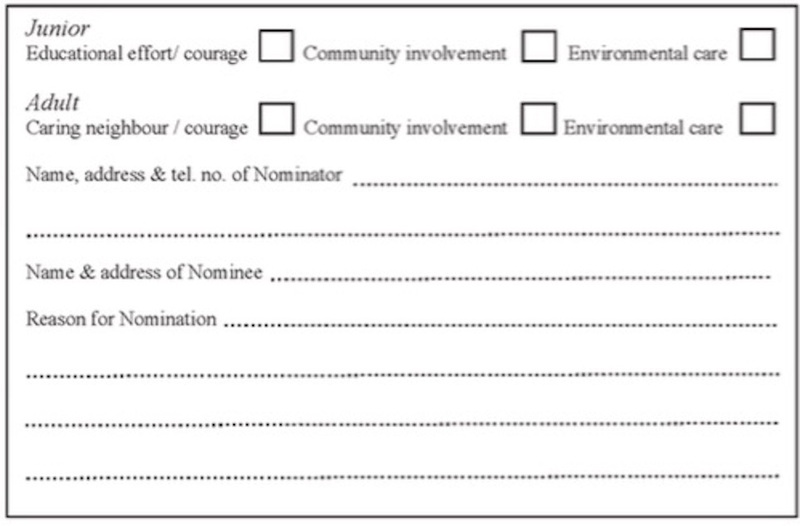 A nominee may only be nominated for one category and in the event of a nominee receiving more than one nomination the judges will decide into which category he or she should be entered. The more information you give us about the person and why they deserve an award the easier it will be for the judges to make a decision. The number of nominations will not effect the judges decision BUT the quality of the supporting evidence will. Illegible nominations will be discarded. Nomination forms & supporting documentation will not be returned. The judges may also present a special community award to anyone they feel has made a significant contribution to our community. This entry was posted in Blog and tagged Heron Awards 2017. Bookmark the permalink.